What a Mixed Bag of Weather! Moderate Snow Falling this Morning! See Where! The other photo up top is from the Boathouse camera at around 9:30am or so. Alluding to that old weather saying, as I began the FirsTrax story this morning things were just a mix of wintry “yuck”. As I was wrapping up the story…it was snowing in some locations. As I began the story, it was just foggy at Beech, App and Sugar…and now I’m seeing some sun peeking through the dense fog…and was still socked in at Beech Mountain….although quickly clearing. We’re Just Getting Started here…. While it IS early in this “startup mode” part of the season, the ski areas that are open could use some love from the weather in the form of snowmaking temps and a glance around all of the mountain communities…it does appear that Wisp, the WV ski resorts as well as the North Carolina resorts should get in three nights of snowmaking mid week. 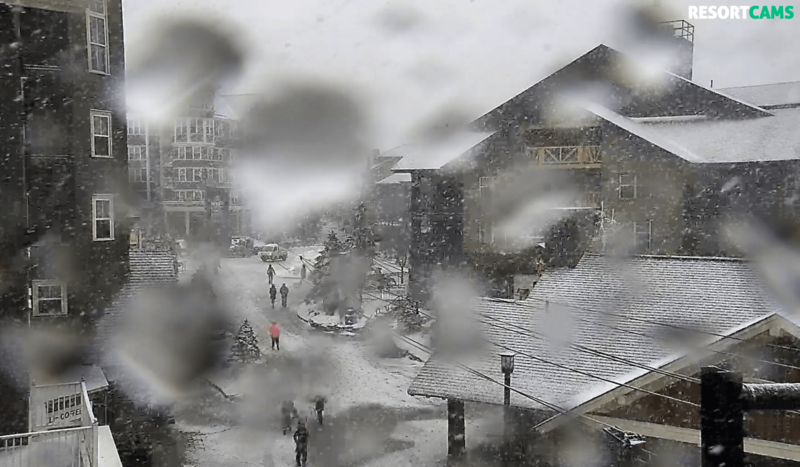 They need it…and so do the resorts that have yet to make snow. The Virginia mountains look good for snowmaking Tuesday and Wednesday nights. Friday was an interesting day in the mountains. Things were pretty nice early. Then as I was leaving Boone around noon, it was snowing pretty significantly and the ground was covered. I arrived back in town around 7pm and there was an inch of snow on the ground. Last night as I was watching some rivalry football games, the freezing rain began to fall…mostly as rain. I checked things as I headed to bed and the decks and trees were all coated with ice. 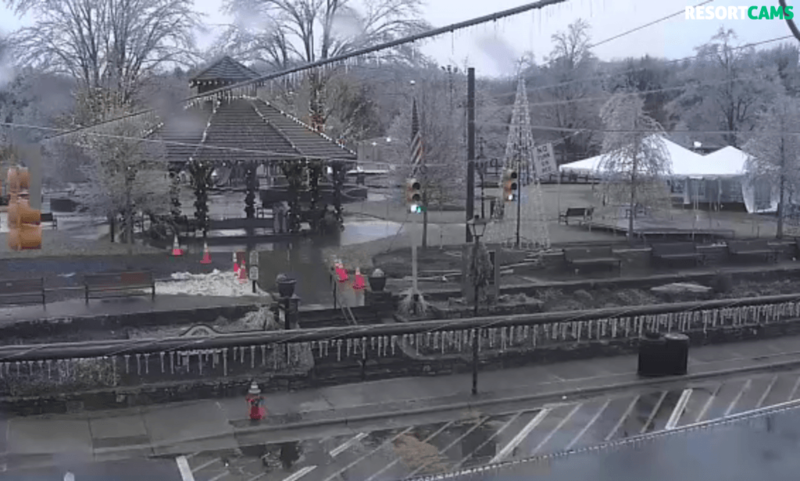 The temps went up a bit overnight and while there are areas covered in icicles…the roads aren’t bad and my deck here in Sleepy Hollow is more wet than ice. By the way, congrats to the Virginia Tech Hokie Nation on that crazy 34-31 win in overtime. Condolences for my friend Joe Stevens and his West Virginia Mountaineers on another score-fest loss 59-56 to Oklahoma. There are widespread reports of trees and power lines down this morning. However the worst of it is over as roads are now just wet. 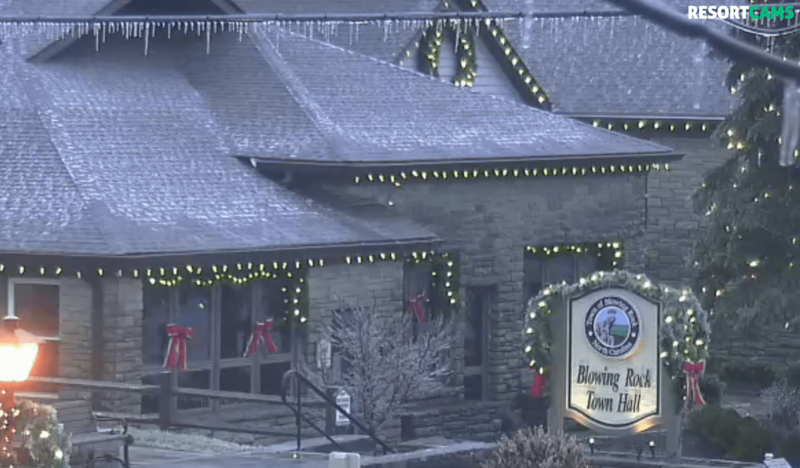 As I was in search of SNOWFALL totals this morning, what I saw were reports of anywhere from 0.26″ of rain/precip at Snowshoe to 0.86″ of rain at Blowing Rock. Temperatures are mostly in the 33° to 38° range so while we may see some icicles here and there, the roads should be fine. The conditions on the slopes will be mostly VARIABLE CONDITIONS despite the fact most are not quite reporting that this morning. CHECK THE SNOW REPORT for the slope details, but suffice to say that all five ski areas that were open on Friday, are open again today with the same number of slopes open…and only a couple of inches drop in base depths. Again, not all ski areas are reporting that drop, but hats off to Cataloochee for reporting a 3-7″ drop and Sugar from reporting a 2″ dip in base. 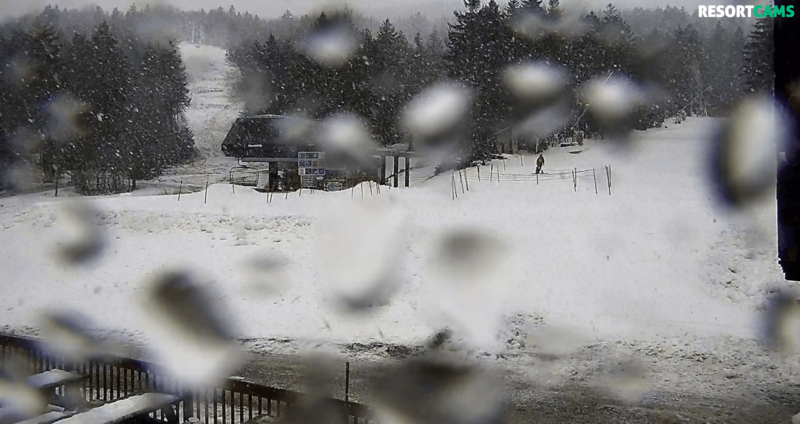 I watched the cams early on Friday and many of the resorts that had not yet been able to make a lot of snow – like Massanutten – were cranking it out. I love anything Christmas related and here’s the latest from Omni Homestead. Man, they do it up right. Click to watch. Here’s the video though…Click to Watch. We don’t normally share 3rd party videos, but this is a nice drone view of Canaan Valley Resort from last season. They will look like this before you know it. Rarely will you ever find a ski resort official happy about rainfall. Our own Joe Stevens has such a distaste for it that when I first met him several years ago he wouldn’t even utter the word. Even to this day he calls it “underdeveloped snow” – which is where we got it from. However, most of the ski resort mountain ops are a bit thankful that this wintry mix system that passed through over the last 24 hours was mostly rain and less ice that many had forecasted. I was headed out of town Friday morning (car shopping) and it was snowing pretty steady…steady enough to have covered the ground with 1″ of snow. However, none of the CoCoRaHs reporters have reflected that. The ski areas will all be doing some snow maintenance today. Cataloochee Ski Area is probably being the most transparent ski resort today, as they reported a drop in base from 15-27″ on Friday morning to 12-20″ today. Cat still has plenty of coverage and 4 trails open for day and night sessions. Appalachian Ski Mountain – They saw 0.81″ of precip (mostly rain) but freezing rain as well. They are open today with 5 slopes and trails for day and night sessions. Saturday is here and it’s a little on the wet side. If you’ve got waterproof gear there’s still a lot of fun to be had out there. The good news is: the precipitation train we had all summer and fall is still chugging along, and very soon these rainy days are going to turn into powder days. The forecast looks good for this coming week and we’ll likely see the return of around-the-clock snowmaking! Please use caution this morning as we are seeing some freezing rain and some roads, parking lots, and walkways may be slippery. Previous articleBeech Mountain Resort Opened Today! That Means Five Resorts are Open Now!